The jagged peaks of the Sesto Region are world-famous. You begin your day among them in Titians hometown, Pieve di Cadore. You then travel to Lake Santa Caterina and view the snow-capped peak of Mt. Sorapis . 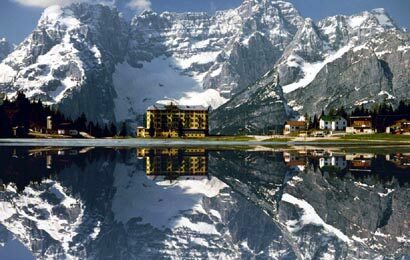 The next stop is the " Pearl of the Dolomites", Lake Misurina and a view of the celebrated Sesto Peak , Tre Cime di Lavaredo. Lunch is in a hidden Alpine Storybook setting. Your journey then continues to the Cortina Region. You pass through the cosmopolitan center and weave through peaks, green fields and meadows bursting with flowers. This is a day of positive peaks and valleys. From your morning coffee nestled among the mountains to your winding drive back to Venice through meadows and glens, your eyes, heart and spirit fill with an energy higher than the highest Alpine peak. There is plenty of time throughout this day for shopping, non-strenuous hiking and, of course, photography. You can not bring too much film. And, your Lecture-Guide makes it a point to show you the best vantage points, then allow you time to enjoy them.